Apple Upside Down Cake gives you two ways to turn your cake upside down. Apples are my favorite fruit. I like them raw with honey or peanut butter. I like them sautéed golden brown, mashed into chunky sauce or in pie, cake and cobbler. I like apples so much that I used them inside and on top of this upside down cake. 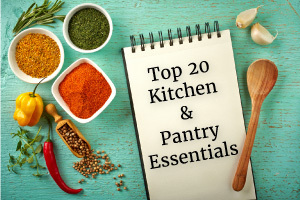 I dig recipes that you can adapt to what’s in season or in your pantry. 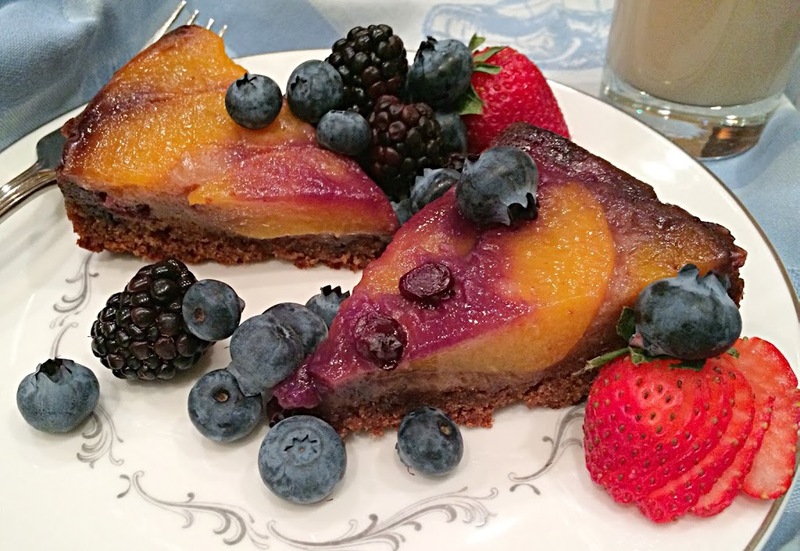 This cake can be made with a variety of fruit you might find in a pie: apple, peach, pear, or plum. Craving chocolate or nuts? Substitute frozen chocolate pieces and chopped toasted pecans, for example, instead of fruit. Well drained, canned fruit like peaches or cherries work well in upside down cake. A combination of fruits adds both texture and visual appeal. We eat with our eyes, after all. Design the fruit pattern by setting the small pieces of fruit down first. Then layer the bigger slices evenly on top, in a spiral fashion or just tossed in for a rustic look. Add in one and a half cups of fruit slices and a fourth of a cup of small berries/ chopped dried fruit. If you add too much fruit, the cake around the fruit won’t cook. The good news is that this cake requires no electric mixer and only 4 tablespoons of butter. You can replace some of the fat with plain applesauce ( no added sugar) and buttermilk. Don’t have buttermilk? Use 1/2 cup milk or cream mixed together with a teaspoon of fresh lemon juice (or white vinegar). Stir the milk + lemon juice or vinegar well and let sit for a few minutes before adding it to the other wet ingredients. 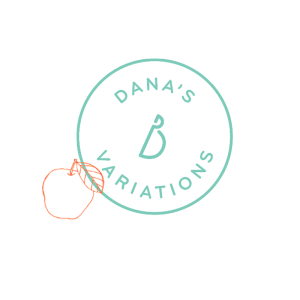 Choose a variety of apples, like Pink Lady, Jazz or Jonagold. 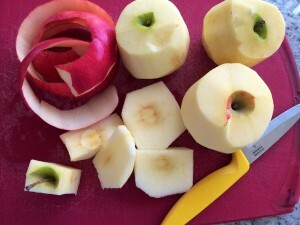 Serving idea: sauté 4 apples and reserve half to serve later with the cake. After the cake cools for about ten minutes, set a plate on the top of the cake pan and flip the cake over so the fruit’s on top. It’s delicious and pretty enough to bring to your next potluck or party. Use fresh apples or peaches and any combination of berries, dried fruit and nuts to create upside down cakes for every season! *Note: This recipe uses white flour and white sugar. For whole wheat pastry flour, increase baking time and for brown sugar, use ½ cup + 1 T for the fruit. Spray the bottom and sides of a 9″ metal cake pan. Line the bottom of the pan with a circle of parchment paper and line the sides completely with several strips of parchment. Preheat oven to 350 F or 325 F convection. If using peaches, drain well and toss with 1 T sugar and a little cinnamon, if desired. Line the bottom of the cake pan with fruit. Set down the cranberries or blueberries first, then spread a layer of apples or peaches evenly on top in a spiral or random pattern. In a large mixing bowl, sift together flour, baking powder, baking soda, sugar, salt and cinnamon. Stir to combine ingredients well and set aside. In another medium size bowl, mix together wet ingredients: applesauce, buttermilk or milk plus lemon juice and beaten egg. Add wet ingredients to dry ingredients and stir gently but thoroughly just until flour dissapears. Pour batter over fruit and smooth the top. Bake at 350 F or 325 F convection for about an hour, until a toothpick inserted in the middle comes out dry and clean. Cake is done when sides pull away from the paper and the top of the cake springs back when lightly touched. Let cool 10 minutes before flipping onto a large, clean plate. Dust with powdered sugar, if desired, just before serving.